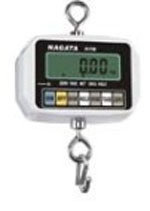 Digital crane weigher with remote control. Auto zero and tare function. 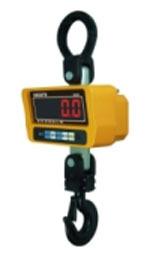 Heavy duty crane scale designed to be used in the harshest industrial environments. Available in capacities 5, 10 and 20 tonne. Bright LED display makes it easy to read In the lowest light applications. Supplied with remote control with tare and hold facility. Supplied in purpose built wooden storage/transit case. Supplied with a foundry heat shield so that the scale can be used in areas up to 1600 degrees C at distance of 2 metres. 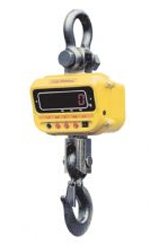 Battery powered, hand held electronic digital balance, suitable for a wide variety of applications from poultry weighing and fishing through to fire extinguisher and general purpose suspended weighing. Key features include kg/lb/oz switching, display hold, tare and auto shutoff to maximize battery life. Supplied complete with padded carrying pouch with belt clip and 1 x 9 volt battery (PP3). Fittings: Top T bar grip handle and bottom hook. Compact, robust and corrosion resistant suspended scale with 150mm-diameter dial. Housed in a tough ABS plastic case with a shatterproof polycarbonate dial cover. Low friction Acetal bearings provide positive movement to give maximum sensitivity. Accurate to 1 part in 250 with up to 15% zero adjustment. Compact and robust suspended scale, with 150mm diameter dial. Housed in the traditional metal case. 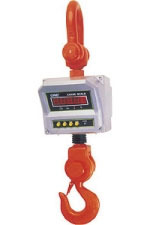 Robust and corrosion resistant suspended scale with large, easy to read 254mm-diameter dial. 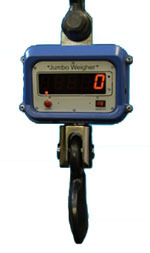 Heavy duty, EU trade approved suspended scale with 254mm diameter easy to read dial. Housed in a robust, grey die cast casing and available in a wide variety of build options. Low friction ball race bearings, up to 10 kg, and nylon bearings, up to 30kg, provide positive movement to give maximum sensitivity. Accurate to one part in 1000 (trade only). Can be supplied with dual marked weights charts (i.e. LB's & Kg) P.O.A. Robust and lightweight, this dual revolution dial scale is ideal for club and competition fishing. Low friction Acetal bearings provide positive movement to give maximum sensitivity. Accurate to 1 part in 500 with up to 15% zero adjustment.